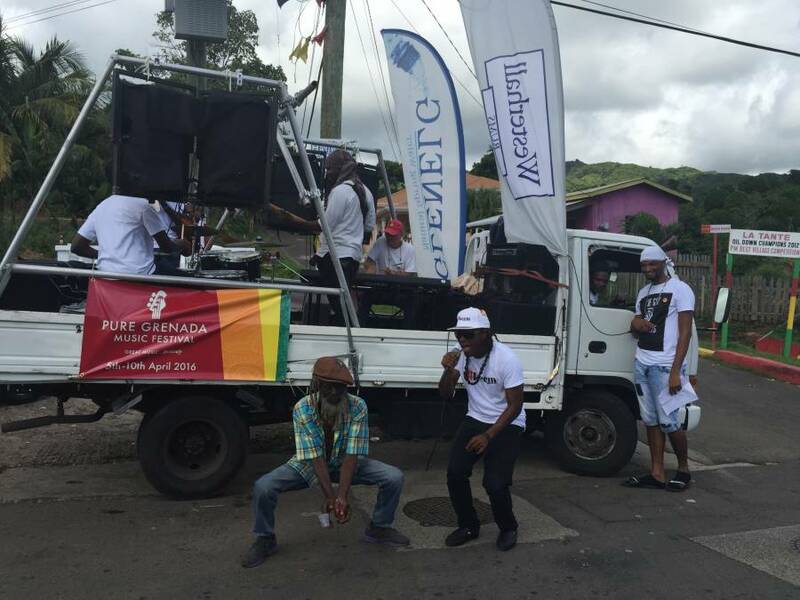 The Pure Grenada Music Festival (PGMF) team took the streets of Grenada by storm on Saturday, 21 November in their island wide motorcade. From the Le Phare Bleu Boutique Hotel and Marina, the convoy travelled the eastern route with major stops in La Tante Junction, the Town of Grenville, Sauteurs, Gouyave and the Esplanade Mall. At each stop, the public was entertained by a DJ spinning tunes from the international artistes and the extraordinary talent of 2 of the Big Stage acts, Grenada’s very own Sabrina Francis and A#keem. Along the way, the Festival Ambassadors — all volunteers, plus representatives from 2 other local bands Jomo & Gylfi and Duanel Barthomew and Sinicar Henry-Rogers from Changes — handed out flyers, shared information and set expectations for the eagerly anticipated 5–10 April 2016. The event also provided a perfect opportunity to share the Early Bird Special of EC$195 for all 4 main stage shows, for Grenadians only. Tickets will be available for December at outlets islandwide and online. The PGMF team thanks wholeheartedly, everyone who supported the initiative including our sponsors, founders and our volunteer ambassadors. To keep updated on the activities leading up to April 2016, like our Facebook page or visit our website: grenadamusicfestival.com.